The Natural Reserve harbours the only true population of Red Deer in the Department of Ain and the Jura Massif. The Deer are constantly increasing in numbers (Photo credits: Clovis and Marceau Duraffoug). The original statutory decree of the Natural Reserve allows for hunting on its territory. However, a minimum of 10% is classified as “réserve de chasse”, which means that hunting is prohibited. Hunting clubs are encouraged to join their territories under a single holding. Several of these are located in sectors where the Capercaillie is present. 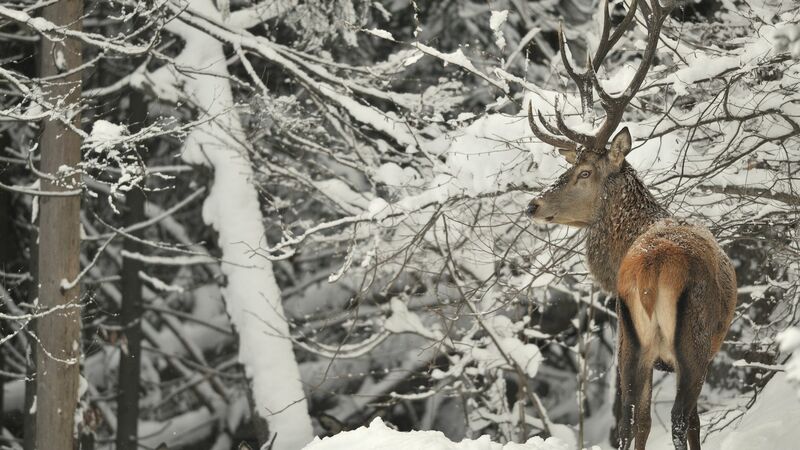 Hunting is prohibited in the Resting Areas for Wildlife (zones de quiétude de la faune sauvage) either when there is more than 15cm of snow or from 15 December each year. Hunting is a traditional pursuit which ensures population control of game animals through a system of culling. On the High Jura, synergistic management is mostly concerned with population control of the wild boar and preventing an increase in numbers of chamois and deer. It is essential to manage the wild boar population in order to safeguard ground-nesting birds (such as the Tetraonidae) and the alpine grasslands. The presence of hunting dogs in the Reserve is allowed, but only during the hunting season; however, the exclusion of all other dogs (except shepherds’ dogs and rescue and guide dogs) remains a difficult concept for other reserve users to understand. But this ban is vital for the tranquility of wildlife, particularly for the young in the spring. Hunting of the Capercaillie was banned in Ain in 1974 and the Hazel Grouse has been protected from hunting under “Plan Zero” since 1995. The Director of the Natural Reserve of the High Jura is qualified scientifically and technically to sit on the Departmental Commission for Hunting and Wildlife (Commission départementale de la chasse et de la faune sauvage – CDCFS).